Hello! 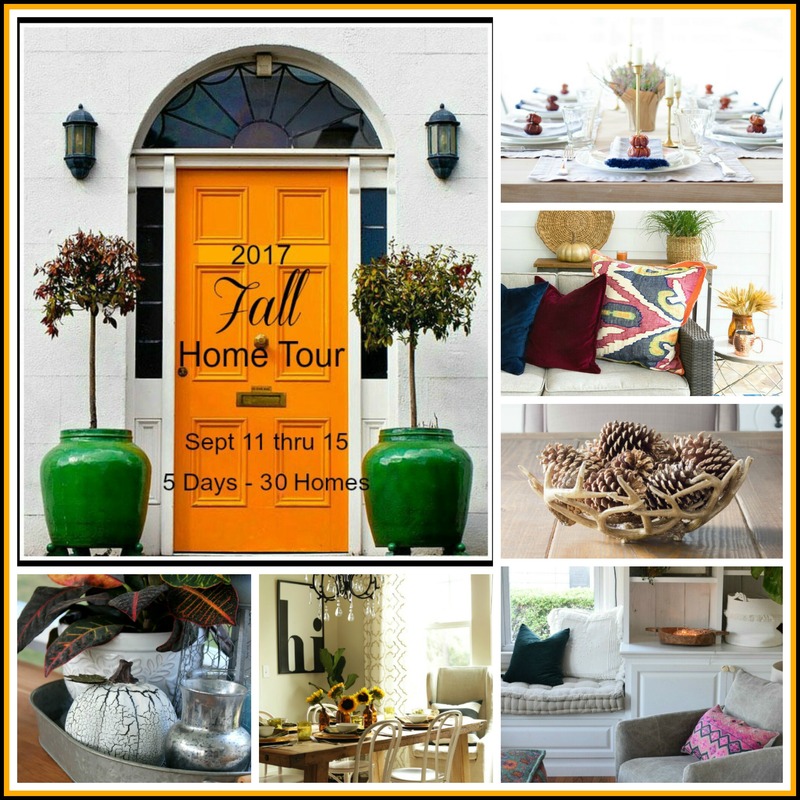 I am joining Marty for her Bloggers Fall Home Tour. 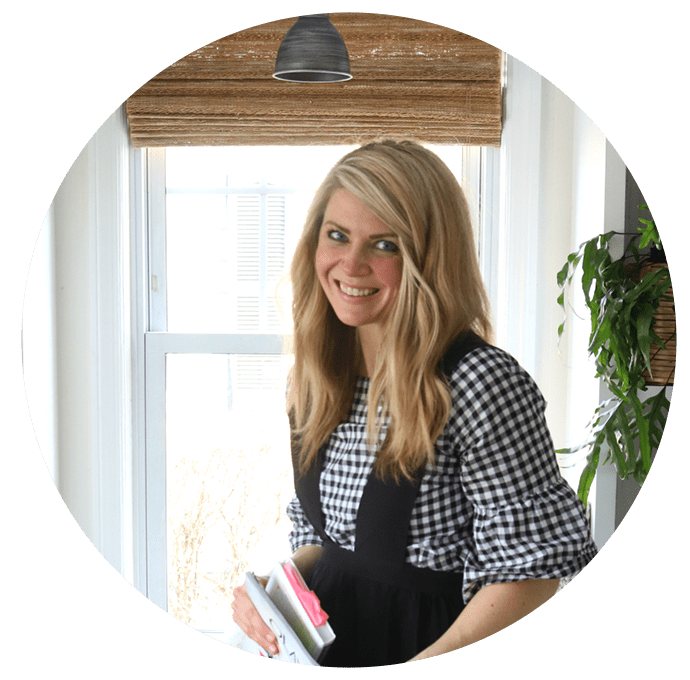 I love to join this tour every season, it is a great way to get inspiration and to share other amazing blogs with all of you! If you are coming over from hbErin Spain welcome to my blog! We are a family of five, living in Connecticut. We are less than a mile to the beach and about an hour from NYC. 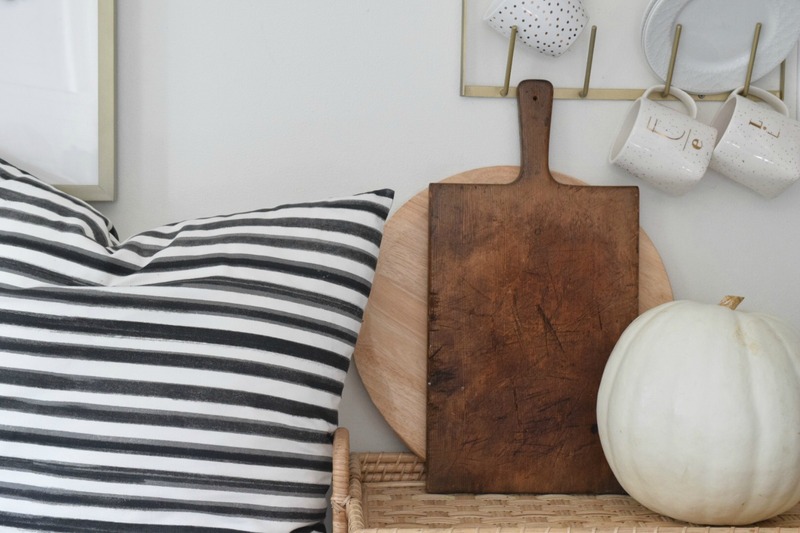 Living in an 1100 square foot house, I don’t do a lot of seasonal decor, but I do make some small intentional changes to my every-day decor and of course add a pumpkin or 20! It is a good time to refresh, move things from room to room and to clean up! So let’s get this tour going! We my Husband painted the front door and changed the shutters to black this past week. 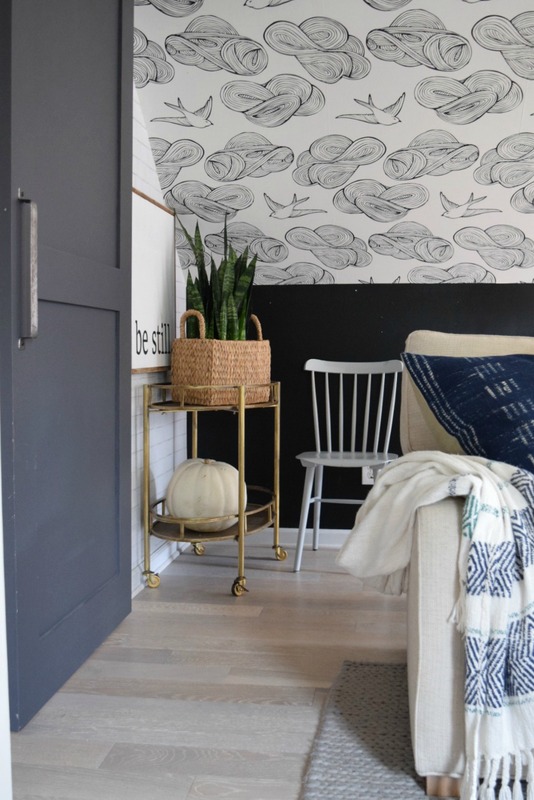 I realized that I didn’t have a lot of navy on the inside of our home like we used to. Now we have a lot of black and white. So painting the door black helped it to flow better. 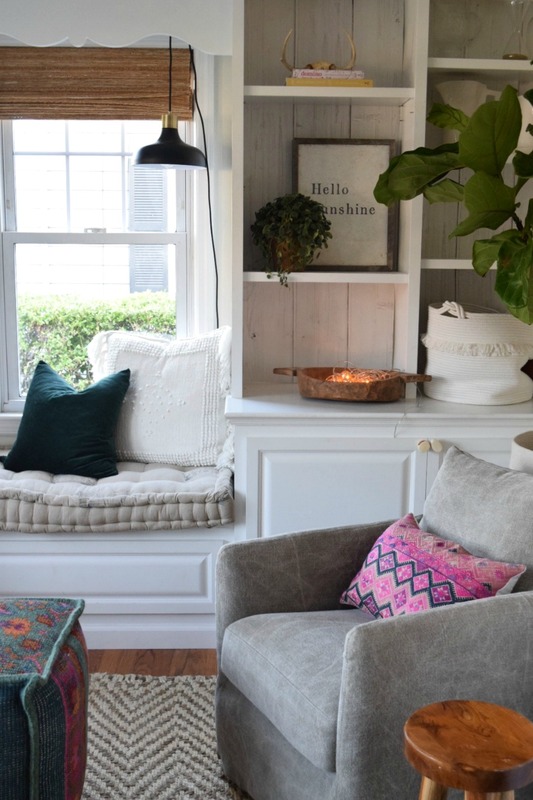 I will share more about the front porch and our outdoor spaces soon. (Wreath on my front door HERE). 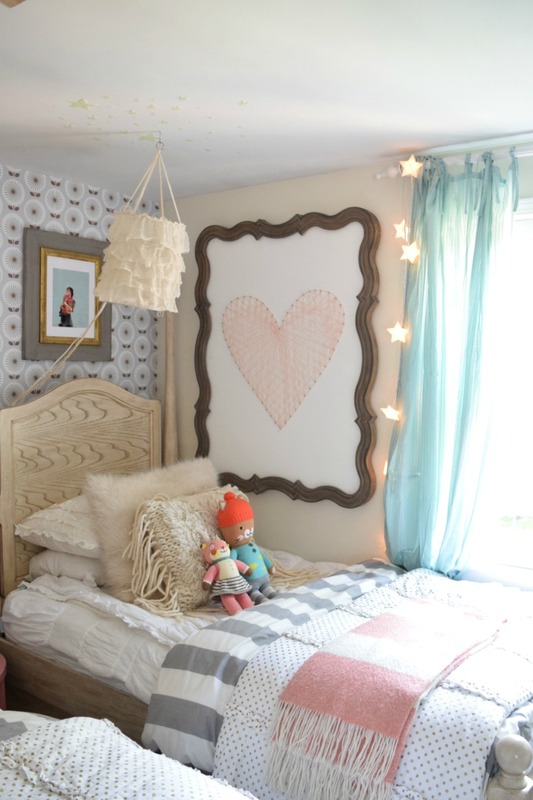 Let’s head up to the girls shared bedroom- one of my favorite rooms! I recently added new wallpaper to their bedroom and switched up the bedding. In the summer it is all about light, airy fabrics. In the Fall I like a lot of texture and layers. 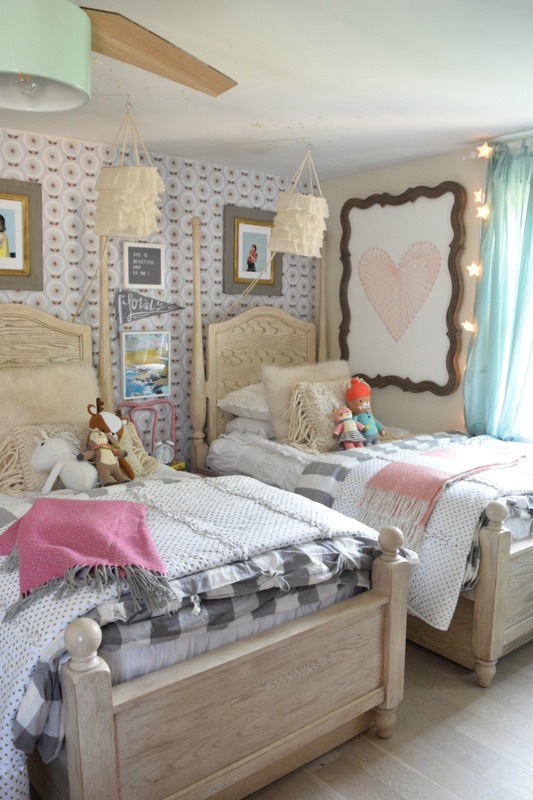 You can see the fur and yarn pillows and layers bedding. (Fur pillows HERE bedding is from Beddy’s Zip-up Bedding use code NESTING15 for 15% off your order). I also switched up their window curtain panels, I wanted to tie in a little bit more the mint green and blueish colors that is in their fan, bookcase and rug. (Find curtains HERE). In the front room I added new swivel chairs- so this is where I put the chair that was in there. 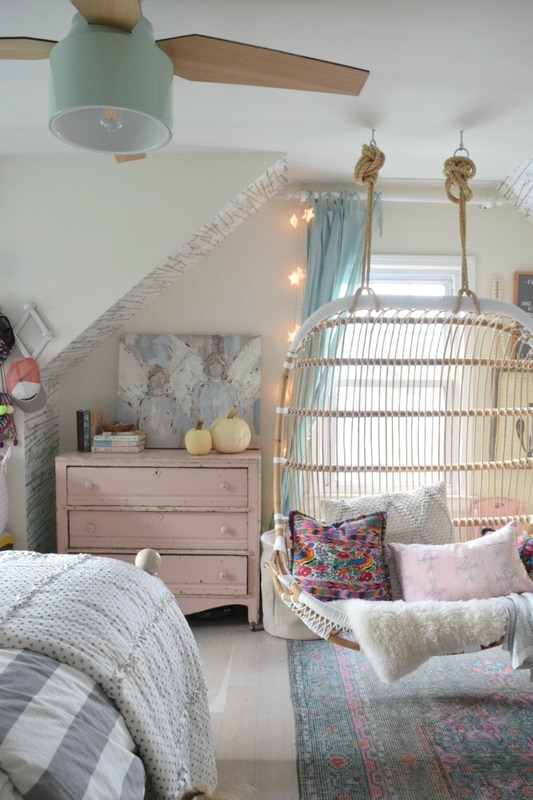 I love it grouped with the double swing, it feels like a space teenagers would hang out! 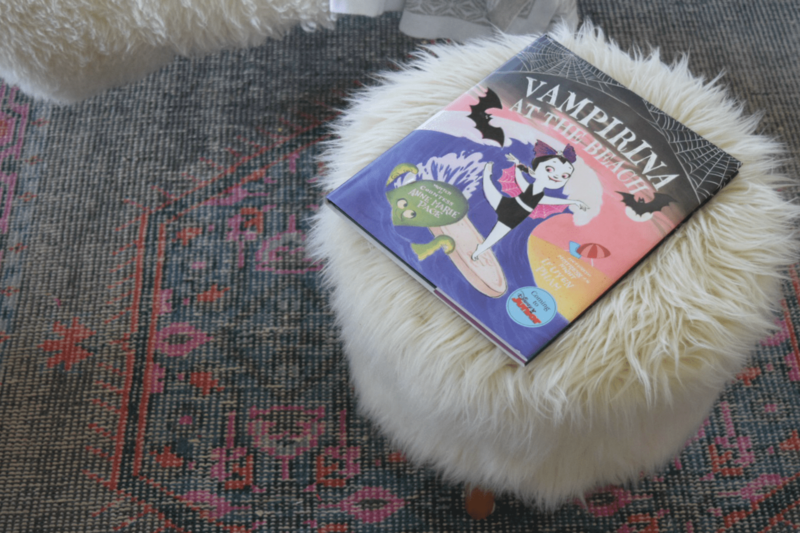 Extra throw and Fall books it is all set! 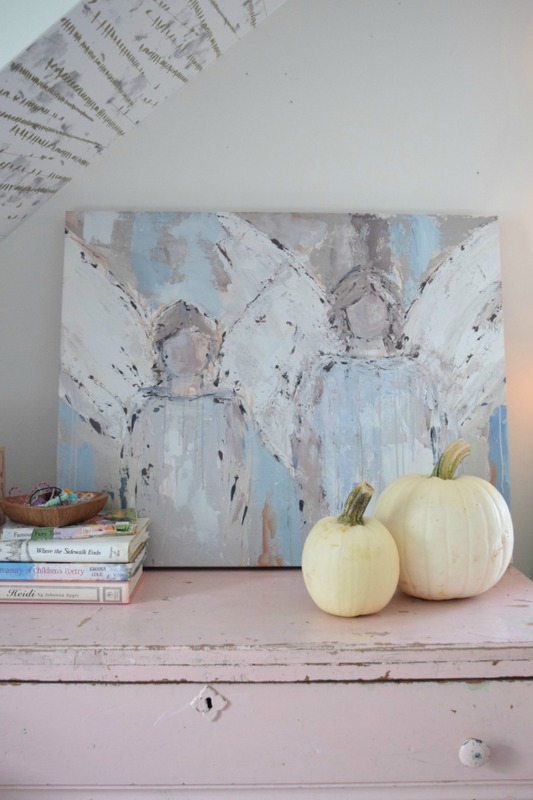 The girls picked out two white pumpkins to put in their room for Fall. 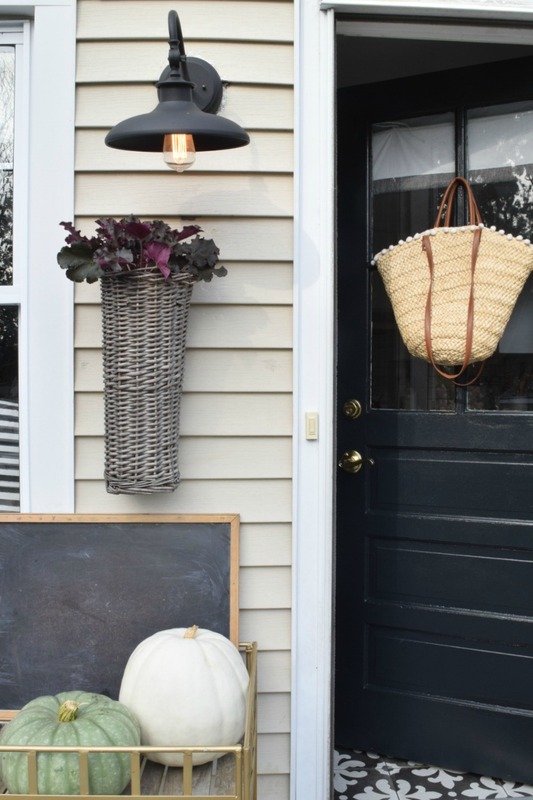 That is the extent of their Fall Decor oh and their Fall Bucket List on our Letterboard. The room next to the girls room is the Family Room/ Guest Room, so let’s pop in there! I really haven’t changed much in this space. 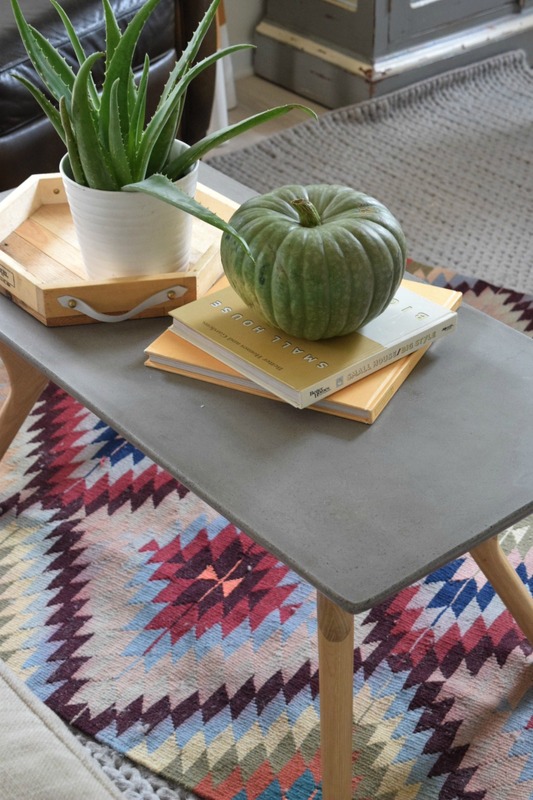 Except I moved the rug that was behind our sofa and layered it over the gray rug in here for more color and feels extra cozy for Fall. We also got THIS new cocktail table in here! I really like the wood legs and the cement top, especially since we do a lot of puzzles here and they like to color in the space when they watch TV. Next let’s walk downstairs to our little eat-in Kitchen. I shared a lot of this space last week. But I have since made some changes that I wanted to share here! We got new bench cushions for our Banquette! I went back and forth on if I was going to put cushions here. But now that we have them, I can’t believe I was ever considering not getting them! 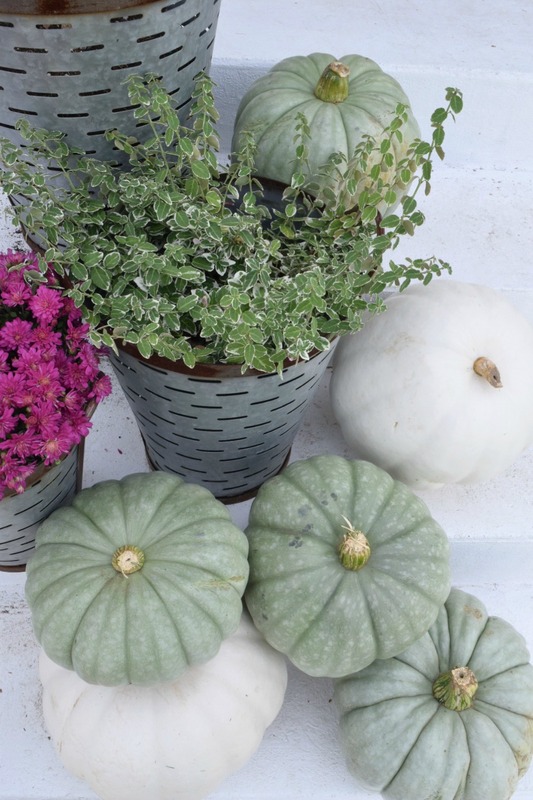 They just scream cozy, especially looking forward to them for Fall. I also got a new table base for our marble top. Yes- it is the same marble I had- I just simply put it on top of THIS table. I ordered them from HERE, they are a French Mattress cushion in a linen fabric. I actually laid here while my girls were doing their homework and I was pretty much in heaven. I added that Fall wreath over our Cony Island Art. Also Pumpkin Paleo Bread is a weekly occurrence around here- especially come Fall. (Find the recipe HERE). You can see the rest of my kitchen Fall tour HERE. Peek at our backdoor- see how great the black looks with our kitchen tile?! 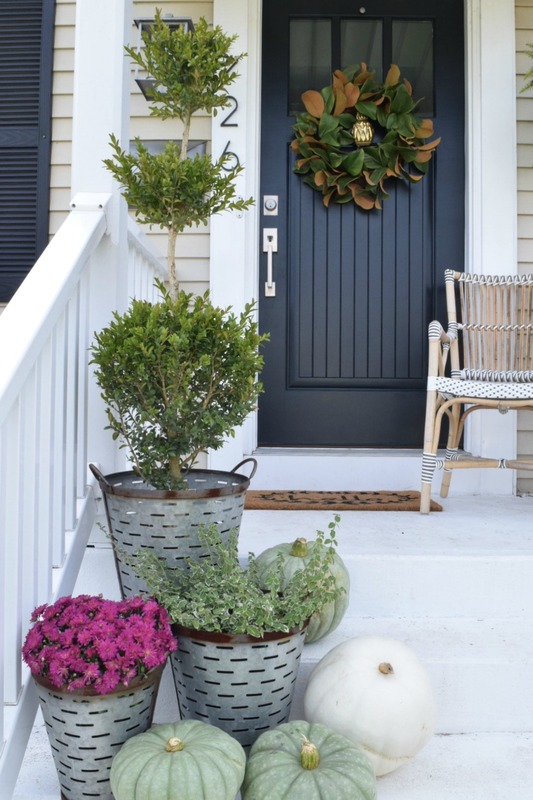 Make sure to subscribe to my blog HERE, I will be sharing our front room Fall Changes, our Front Porch and Back Deck next week! 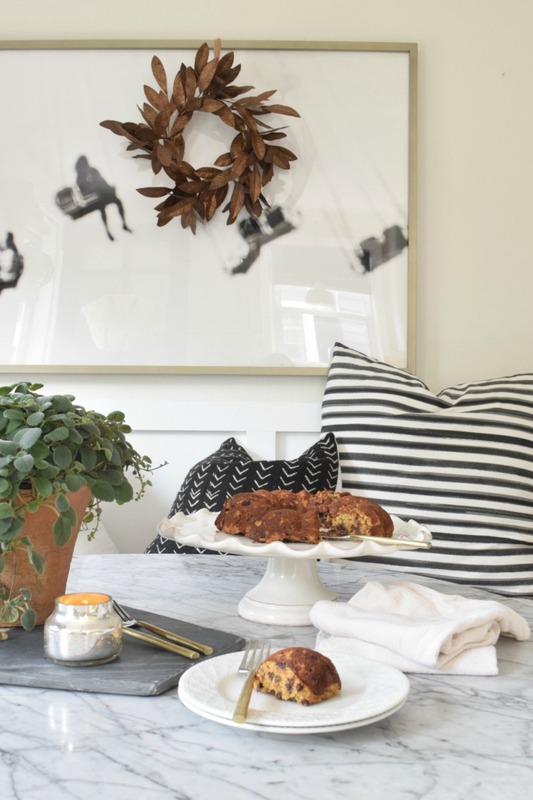 And keep following along on the Fall Decor Blog Tour! 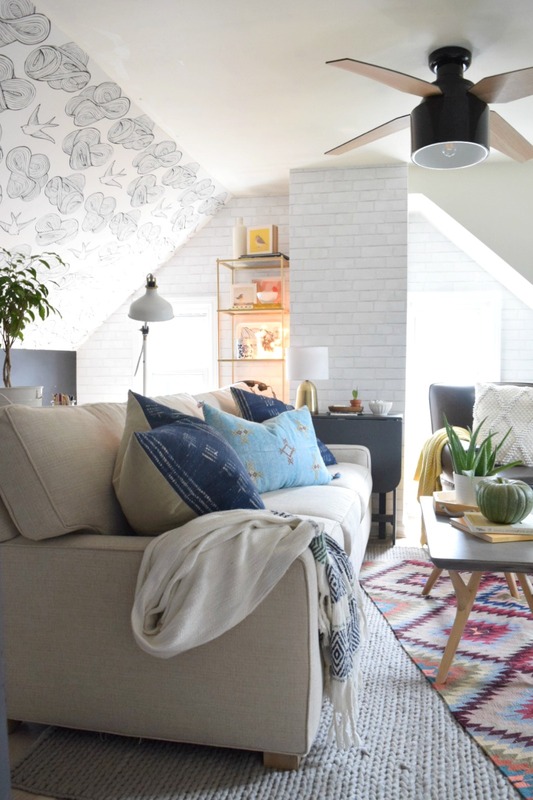 Next up is 21 Rosemary Lane, Barbra is full of design content and shares a lot of great ideas! Thanks Clarissa! I love them too. I should have taken more but in that family room is out ugly window unit…but I guess that is our life. I will have to show it! Love it all. Your home is always so full of inspiration. 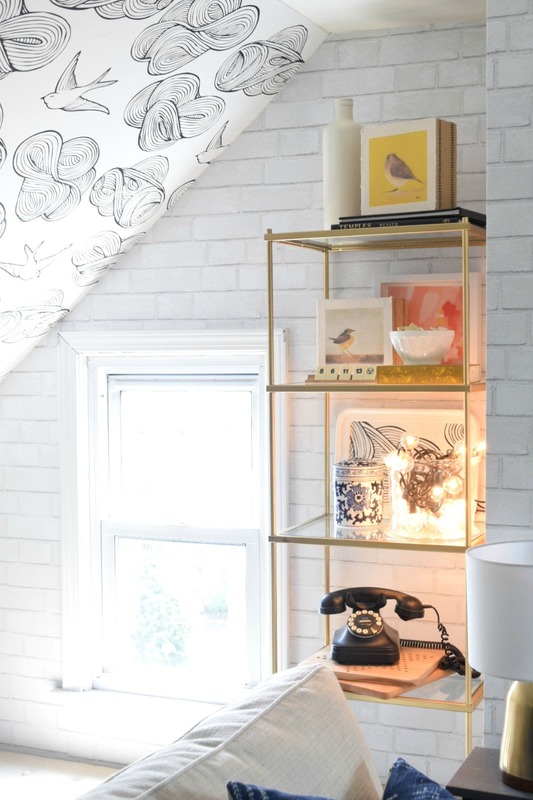 I love how you layer accessories around your home to make it feel so warm and inviting. Thanks tons for joining the tours. Thanks Marty! And thank you for all your work on organizing the tour! Your tours are always amazing and they leave me wanting to be a kid again so I can move into your kiddos room. 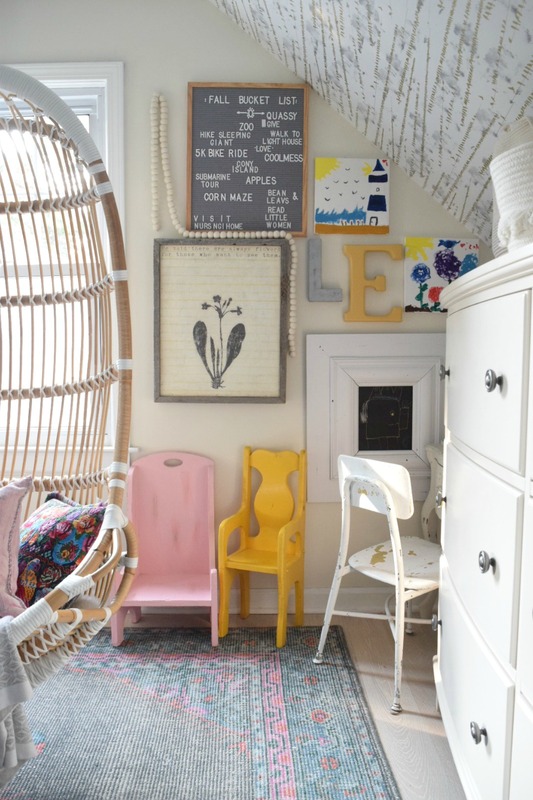 Seriously the best kids room ever! Thanks Julia! 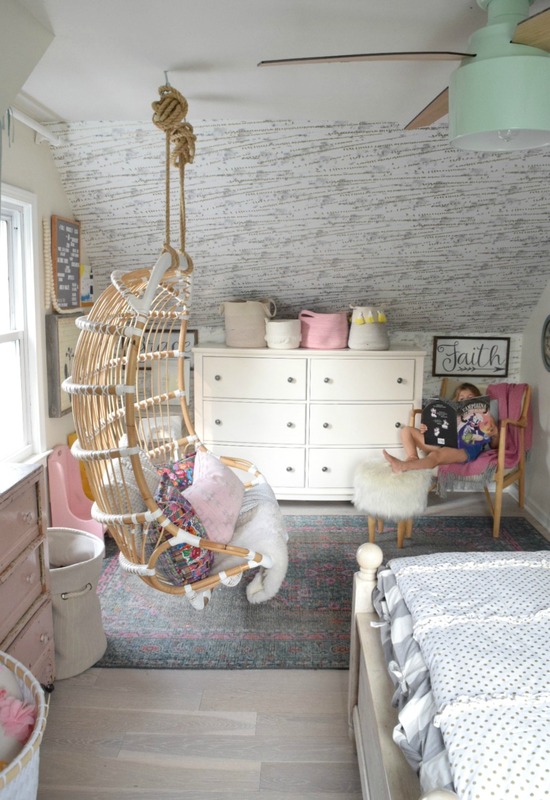 I know, I want my girls room as my room too! 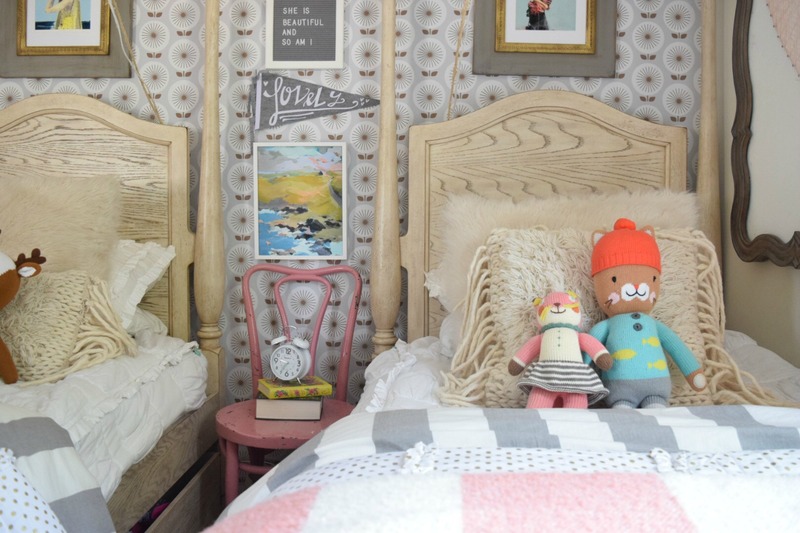 Your home is filled with inspiration in every nook and cranny and I just adore your daughters’ bedroom!!!! Fabulous tour! I also love the green pumpkins all around! 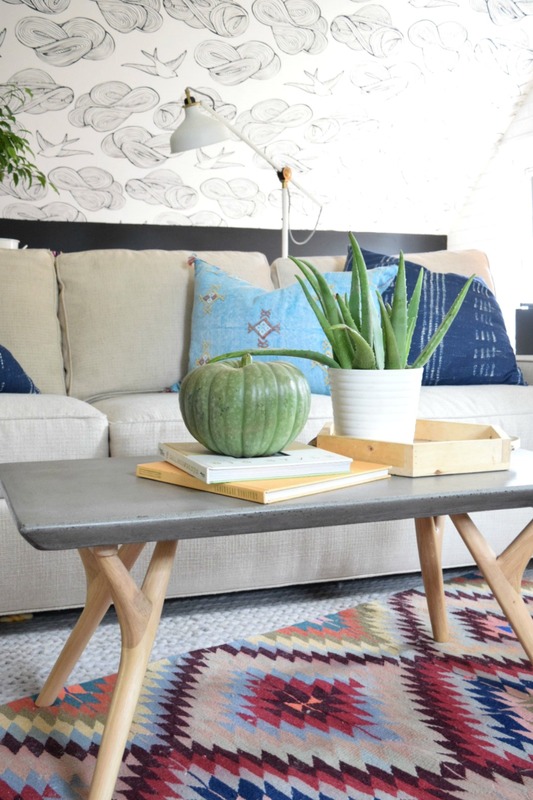 As always, honored to share this home tour with you, cheers! Thank you so much Vel! I appreciate your kind comment! And same here! You are the best, thanks Shawnna! 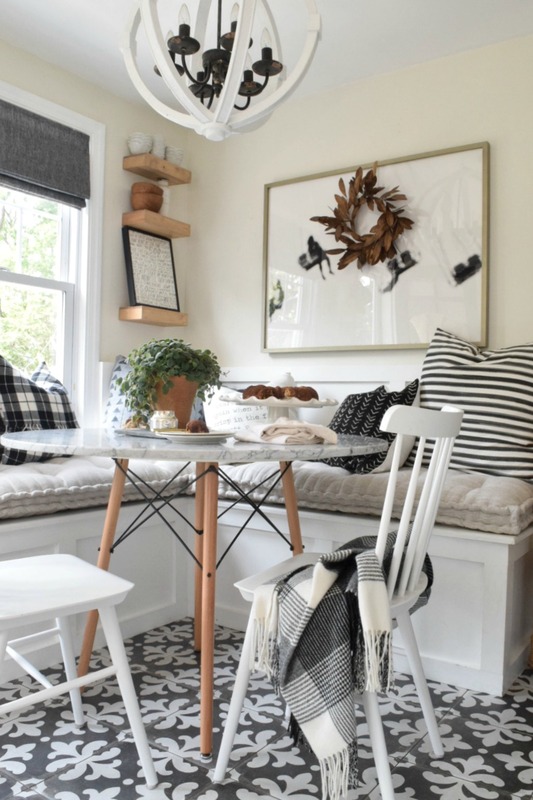 Love your decorating style! Everything is cozy and fun. 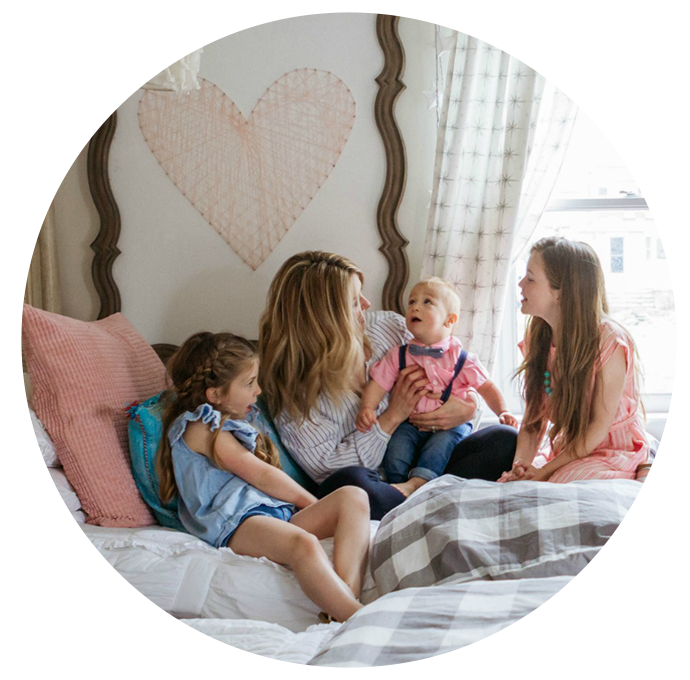 I bought the gray and white duvet cover after seeing it on your blog in your children’s room. Enjoy getting ideas from your great taste. Thank you Tracy! I hope you are enjoying them! You have such a beautiful, beautiful, beautiful home! 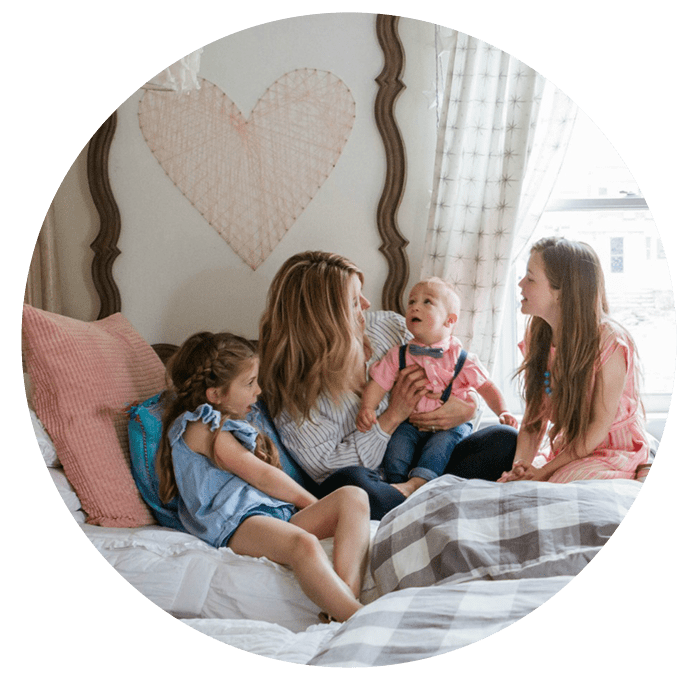 I love all your unique touches and your children’s rooms are so sweet! your home is always one that I feel like I stay longer then I should! I just love how you make it all come together. 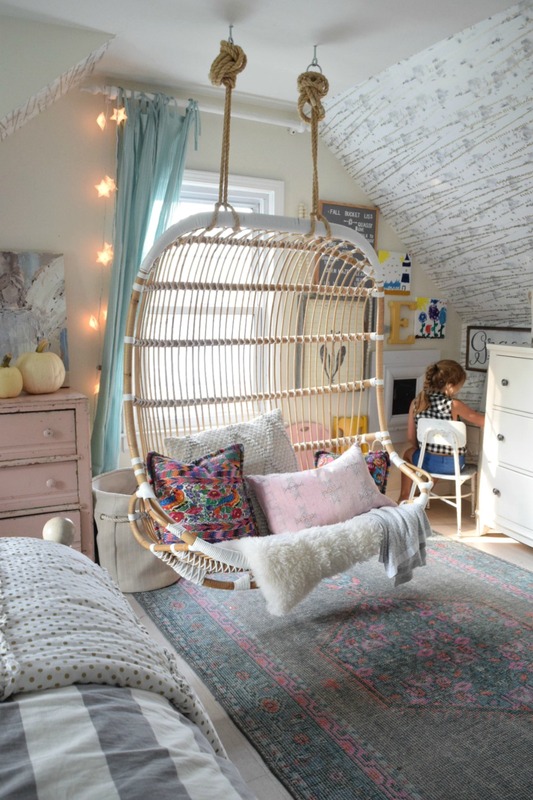 That swing in your girls room is amazing. I am sure they never want to leave their room. Are there pumpkins out yet in Conn? not in North georgia now. Yes we have pumpkins all over in CT! Your house is so cute. Goofy question…where do you have your washer and dryer? We have a big basement! It can’t be finished due to flood zoning. So our food storage, washer and dryer and other things we hold onto are down there. The girls tumbling mat is down there too! Your home is so lovely!! I love so many of the fun little details. Could you please tell me where those adorable little animals on your daughters’ beds are from? I’m thinking my daughter would absolutely love them! Thanks so much! And a couple of them are from Cuddle and Kind!